As we welcome 2014, we also look forward to major projects that will help alleviate transport and traffic problems in our cities and elsewhere in the Philippines. With the approval of the MRT 7 and LRT 1 south extension projects late last year, there should be less impedance to these much-delayed projects starting construction within the current term. These lines should have been built way back, – “ideally” in the 1980s, “practically” in the 1990s, and “urgently” in the last decade. At this time, I think the need for these lines are beyond urgent. I think perhaps we have reached the state of “desperation” is so far as mass transportation is concerned for Metro Manila and its surrounding cities and municipalities. MRT 7 map from a public presentation made by the line’s proponents about 5 years ago. Opportunities that can be related to the MRT 7 and LRT 1 lines include land development that fall under the category of transit oriented development (TOD). I think the government should not be too dependent on the private sector for developments around and near the future stations of the rail lines. The prevailing assumption that the private sector will do what’s best is only applicable to themselves and not the public good. Note the difference between perspectives here where it is only to be expected that private companies will be concerned with their own bottom-lines, i.e., revenues generated towards the maximization of profits. Economic benefits are and should be treated or regarded differently from such a perspective. The latter is the responsibility of the government as it concerns the public good and interest, and with a more macroscopic and strategic scale, with a long-term vision for development. One such opportunity concerns informal settlers and their resettlements to areas outside the CBDs. Why do these people keep on returning to the cities when they are already supposed to have been provided housing elsewhere (e.g., Bulacan, Laguna, Cavite, Rizal)? The answer seems almost automatic: they don’t have the means for livelihood where they have been relocated and access to basic services and jobs/workplaces is limited (i.e., very difficult). The government must be involved and very deliberate in developing lands for housing around or near rail stations such as those for the future MRT 7 development. It cannot rely on the private sector to push for public housing when, frankly, those companies are driven by their desires to maximize their profits rather than push for the public good. That’s a bit of reality that we must accept and we must factor in decision making. The government already lost a huge opportunity when the National Housing Authority (NHA) effectively gave away prime lands in Quezon City for an upscale development. I leave it up to the reader to check the mandate of the NHA. It could have pushed instead for a development much like the HDBs in Singapore, which are not located in the boondocks but in prime locations in the city state. It need not be purely residential but a healthy mix of commercial development should be pursued along the lines of equitable transit oriented development (TOD). Note that it should be clear here that when I say public housing this does not necessary mean the mass housing or low cost housing we tend to associate with failed projects in the peripheral provinces to Metro Manila. These are more like multi-level, medium to high rise developments you now find in major cities in Japan, China, Thailand and Singapore, which can be the model development for replication in other cities around the country. These can be reasonably priced units that can be affordable in terms of payments over a reasonable period of time. The concept is not new as there have already been BLISS projects before and Quezon City continues to collaborate with private sector for projects like Smile, Sunny Villas and the current Bistekville. These should be extended not just to your middle class and upper class (yes, they do make investments and have their units rented out to derive income) but formulated for the lower income classes (e.g., informal settlers), which now occupy much lands with their shanties. “Formalizing” these settlements should be a priority and the best locations for such developments, I think, should be around stations. Of course, there should be clear rules regarding the neighborhood and these rules should be strictly enforced for the buildings and area to keep their integrity (e.g., no extensions to the balconies or windows). The concept and application of land-banking is not new and has been used by the private sector especially major developers like Ayala Land, Filinvest, Sta. Lucia, SM and Robinsons. Properties are acquired based on criteria regarding their potential for development. These lands are usually of low value and in many cases the land use need to be changed in order for these to be developed (e.g., agricultural lands being converted into residential, commercial or industrial uses). The national government and local government units should also do land-banking perhaps to address issues, for example, on informal settlers. 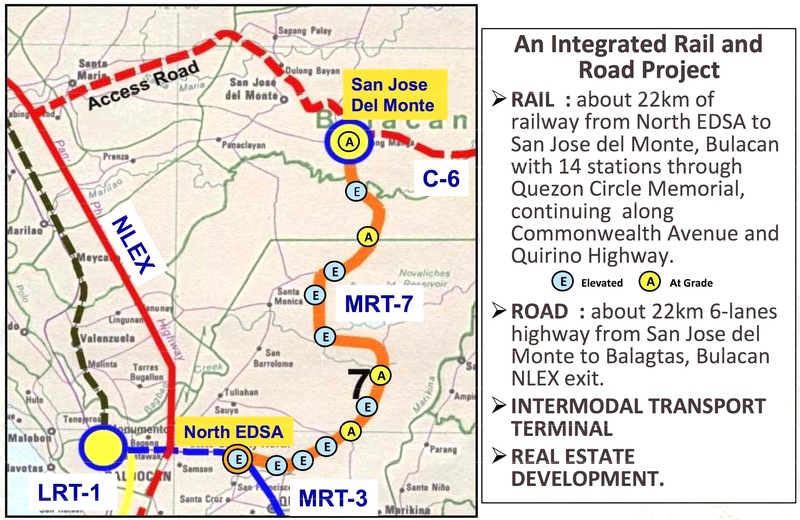 And land banking should be along transit lines that are being planned (e.g., in Bulacan for MRT 7, in Cavite for the LRT 1 Extension, in Rizal for the LRT 2 Extension, and in Laguna for the PNR Commuter Line) so that issues pertaining to access to jobs, education and other services can be addressed by such transport infrastructure. We look forward to the government realizing such opportunities that have for so long been available yet it has not taken into serious consideration. These require both strategic and practical thinking to be able to undertake master planning for such developments and their implementation over the immediate to long terms. No easy task but if our leaders are focused and determined to see these through, there’s no reason why these cannot be implemented and operational soon. Hopeful we are for these things this 2014. By d0ctrine in Infrastructure, Public Transport, Railways on January 1, 2014 .